The traditional manufacturing process for induction coils relies on soldering. While this has been a tried and true method, the process is complicated and creates imperfection in the final product. The operating time and quality of manually manufactured inductors do not meet the growing demand of the industry. 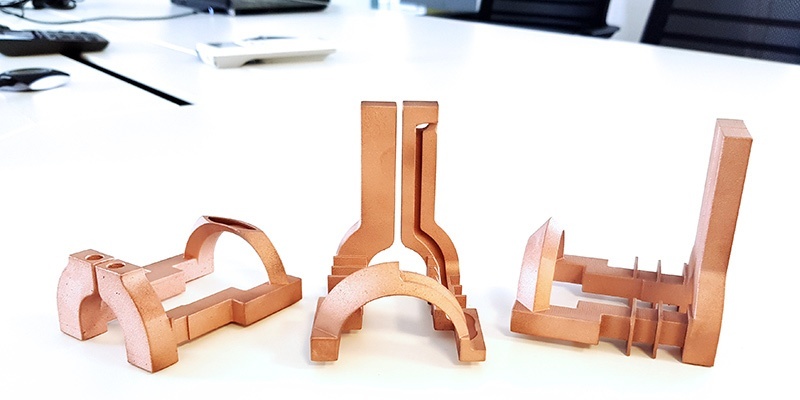 Today, users can take advantage of metal additive manufacturing (AM), which offers superior parts and robust production of highly complex geometries. In our last blogpost on inductor coils we've explained step-by-step how you can easily switch from traditional manufactured to 3D-printed inductors. In this blogpost we'll highlight all benefits of 3D printed inductor coils, that will allow you to reduce your overall costs by up to 50 percent. Today, 3D printing (selective laser melting) can solve the problems that arise from conventional inductor production and enable reproducible hardening results in series for the first time. 3D printed inductors without soldered joints require less energy, have higher efficiency and can achieve homogeneous hardening results. In selective laser melting the metal powder is melted by laser and built up in layers to form a 3D object. 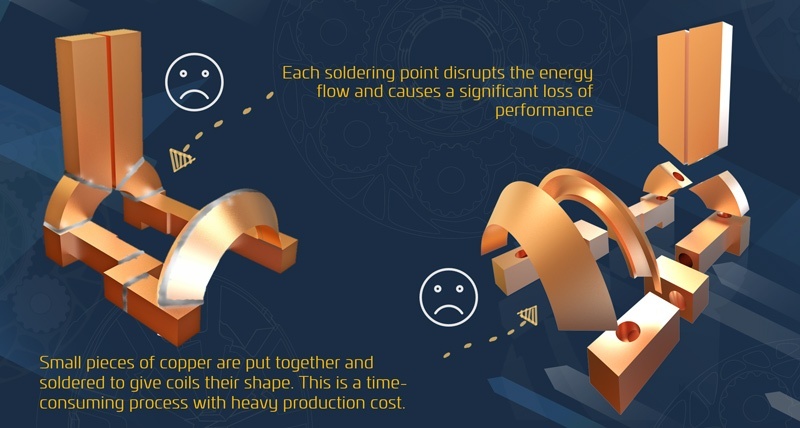 Due to the unique freedom of shape and lack of soldered joints of the inductor coil a higher efficiency hardening results can be achieved with less energy consumption. The components hardened with a 3D printed inductor has a higher load-bearing capacity, even at critical areas of a highly complex component geometries due to a more homogeneous hardening depth. The reproducible production of the inductor geometry now enables a reliable series supply. Better utilisation of the hardening systems due to the longer life time of the coil reduces operating and investment costs. Production downtimes are reduced also due to the faster set-up of the identical printed inductors on the hardening machine. No more need to have a large inductor stock because the inductors without solder joints wear out more slowly. 3D printing is not only recommended for the production of filigree geometries which traditionally cannot be realized. The process is also attractive and profitable for standard geometries. 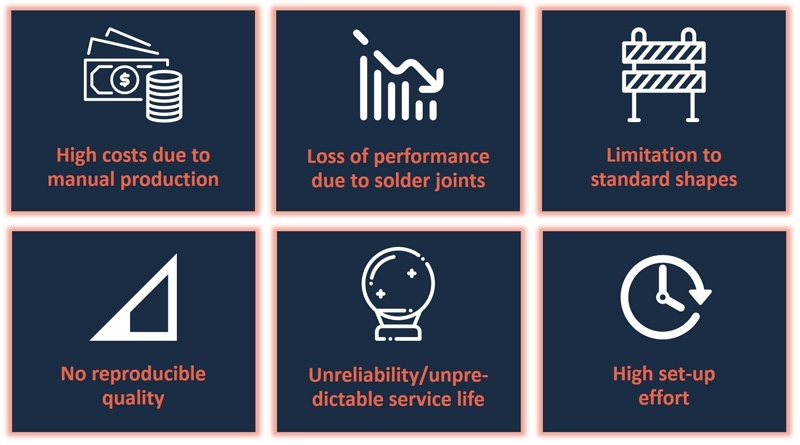 Users can expect the same costs as for conventionally soldered inductor geometries and eliminate all the disadvantages of the conventionally soldered coils. The service life of a standard geometry also increases with 3D printing. For example the parts produced under the GKN Powder Metallurgy process have achieved up to a 400% percent longer service life. Inductor coils undergo several mechanical manufacturing steps to be produced. The coils get their shape via manual bending and soldering, in whereby small pieces of copper (tubes) are put together and soldered. This is a time-consuming process and incurs heavy production costs. The more complex the geometries are, the more individual elements are required to be soldered. When there are multiple solder joints next to each other required to achieve the desired geometry, several soldering agents with different melting points must be used so that the first solder does not come loose while the second solder is applied. This creates manufacturing challenges as soldering must be performed quickly. Heat will transfer to the first soldered point while soldering the second piece. This additional heat could dissolve the solder from the first point. Even experienced workers perceive this as very complicated and tricky work. Each soldering point disrupts the electrical current flow and causes a significant loss of performance. The inductor’s efficiency is not only reduced by soldering joints, but also by the restriction of the inductor's geometries and their reproducibility. In a traditional inductor coil production, geometry options are limited to relatively simple standard shapes. However, the inductor achieves a higher efficiency if the geometry can be created as closely as possible to the contour of the component which has to be hardened. The closer the shape of the inductor follows the contour of the component, the more homogeneous is it’s hardness pattern. According to the principle “form follows function,” the shape of the inductor determines the efficiency. The conventionally produced inductors have led to many problems and disadvantages. They incur high costs of the production and are unreliable due to an unpredictable service life. Because each inductor is handmade and every worker solders differently, there is also a direct correlation between the individual skills of the worker and the quality of the inductor. The problem for the end user then is the life time of the inductor coil. The durability cannot be predicted due to the high variations in quality and the only way to prevent service downtime of the hardening machines is to build up a large coil stock. If you are a manufacturer considering using 3D printing to produce your inductor coils, you need to find a full-service provider. Additionally, you want a full-service provider that is not only dedicated to its customers, but also understands the materials to be used and can provide proper technical advice throughout the production process. A proper 3D printing supplier should be able to offer fully customized parts and offer geometry optimization that enables the production of identical inductors in series with a global quality standard. Benefit from the significantly higher efficiency that you can achieve through 3D printing and contact us for more information.